5th June 2018 - Overclockers UK - Originally launched in 2013, the Polaris MK1 was 8Pack's ultimate gaming machine. Featuring an i7-3770K and two NVIDIA 6GB GTX Titan cards, it was an incredible machine even by modern standards. Today however 8Pack is proud to announce the release of the new Polaris MK2. Powered by a 4.7GHz 12 core i9-7920X, the MK2 has been overclocked to its maximum potential for gamers who demand the very best 4K HDR gaming has to offer. Combined with two overclocked 11GB GTX 1080Ti's in SLI, the Polaris MK2 also doubles as the ideal workstation solution, able to tackle rendering and simulation based tasks with ease. Starting at £9599.99 the Polaris MK2 is a tailor made system in every sense of the word, featuring chassis modifications, custom acrylic pass through plates and even a redesigned motherboard mount. It's truly a show of master craftsmanship. 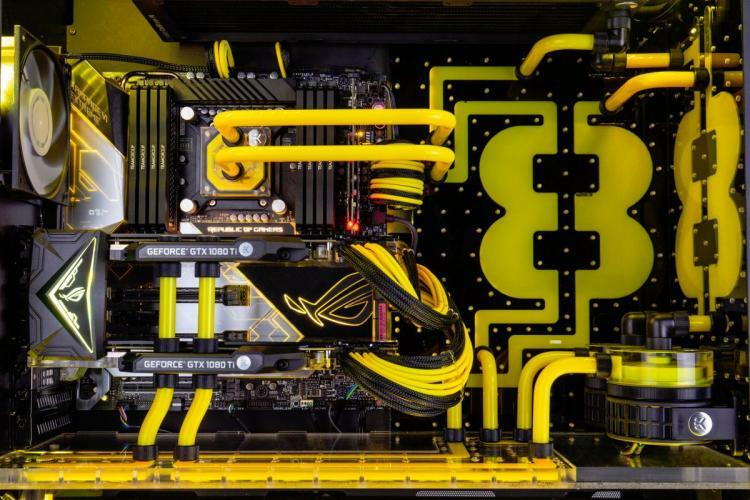 The motherboard of choice for this powerhouse is the ASUS Rampage Extreme X299, a fully featured flagship X299 chipset board from the Asus' Republic of Gamers series. This ensures stability for the cherry-picked 12 Core, 24 Thread Core i9 7920X at the highest possible clock speeds. ASUS's motherboard also enables installation of 64GB of 3200MHz 8pack Edition memory, made with hand selected Samsung dies to improve stability and efficiency. We've chosen 64GB because this is the ideal amount for rendering and coding. In terms of storage the Polaris MK2 offers two 1TB Samsung 960 Pro NVME SSDs, one for primary OS storage and applications with the additional for gaming or multi-media. 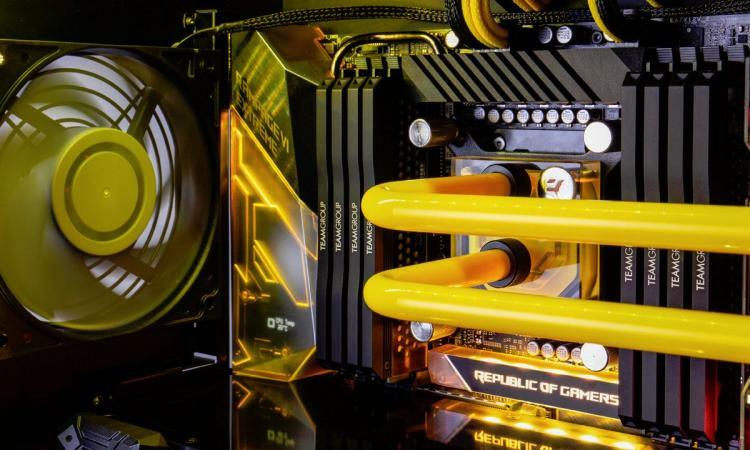 The Polaris has been built inside a Lian-Li PC-V3000WX, featuring not one but two 8Pack branded reservoirs, four custom acrylic pass-through plates and an array of EK hard-piping. The case itself has been improved by replacing the standard motherboard mount with a custom made black acrylic version. This mount provides the support needed for the entire acrylic back-plate, as well as having additional cable management slots CNC'd into the mount itself to route the CPU, GPU and 24 pin custom braided cables. Beginning with two EK Revo D5 pumps the Polaris runs two separate water-cooling loops, one for the CPU block and another for the two GTX 1080Ti in SLI. The GPU loop feeds through the bottom pass-through plate, up into the GPU water blocks and back down into the 480mm RAD located in the lower compartment. If you look closely however you'll notice that the RAD is not only supporting the bottom acrylic pass through plate, but also actually mounted on its own additional black acrylic mount, designed specifically to support the pass-through plate. 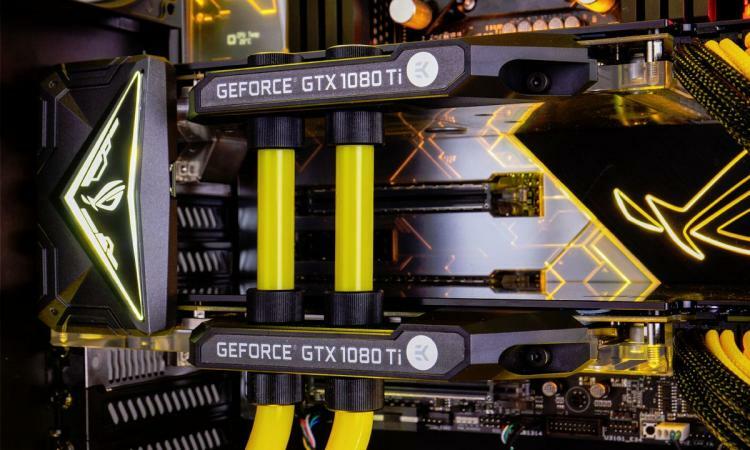 The GPU loop doesn't stop there however, it then feeds back through the entire block and up into the rear mounted pass-through plate to the first of it's own 8-PACK branded reservoirs. Lastly the GPU loop finishes by running across and through the identical 8Pack reservoir seen in the fourth and final acrylic plate. The CPU loop is considerably more straightforward - following the left hand side of the 8Pack logo, into the CPU block, to the top mounted 360mm RAD and finally passing back through both of the 8Pack branded acrylic reservoirs. Unlike previous 8Pack machines, the acrylic pass-through plates have been created using a CNC machine rather than laser cutting, which whilst a more costly technique gives a more premium finish. The precision cutting also allowed the Polaris build to use two acrylic layers in each plate rather than than three in previous models. There's also a specially guarded in-house technique which allowed the elimination of industry standard o-rings normally used in this process! CPU - Intel Core i9 7920X Hyperthreaded Twelve Core Processor @ maximum possible stable overclock with EK EVO CPU Waterblock. 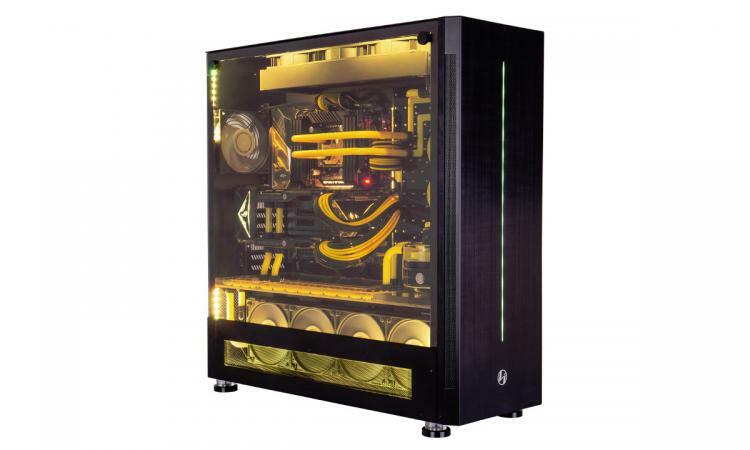 - Each system is hand built and tuned by the World's Number 1 Overclocker. - Fully customisable colours, flexible specification with tailor made solutions and consultations with 8Pack prior to ordering. 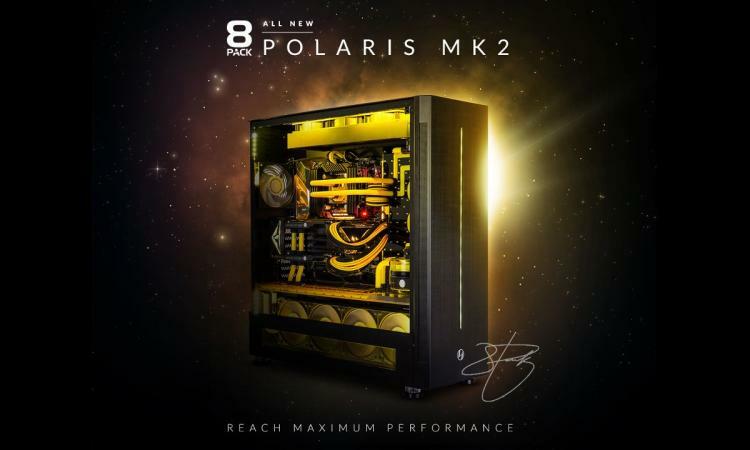 Each unique 8Pack Polaris MK2 system is available from Overclockers UK exclusively. For more information visit the landing page at https://www.overclockers.co.uk/lp/8pack-polaris.html.